Black and white is another world: they do not feel because there are no tears; where blood is grey, there is no pain. The grainy ghosts are trapped in trenches or hanging on the old barbed wire. We’ve seen them, we’ve seen them… Or have we partially glimpsed and never really cared because they aren’t quite here? Perhaps they’re laughing in two dimensions, drinking silver clouds and eating ash. Or are they noble and beautiful and bathed in the sun of a thousand flowers and angels? It’s hard to tell: the lens to World War I is cold as stone, shaded with drabness, sombre as the night. But then someone injects red into cheeks and blue into clouds, and we see real life: the daughter of God dancing in the sky; the colour of courage, the triumph of freedom. It is not black, but a glorious pageant of patriotism and pride. Some wars are fought to subjugate and oppress; others to redeem and liberate. Some arise out of vengeance and resentment; others in pursuit of justice and peace. There are conflicts of land and wealth or power and glory. The righteous rhetoric of dictatorship carves into the democratic commonwealth. The principalities of theocracy, plutocracy and oligarchy seem to be perpetually ranged against liberty, justice and the rule of law. In the realm of rationality, there can be no concessions: victory is the goal, and virtue the motivation. But their morality is our insanity; their freedom is our captivity. Show us impotence, and you will see a slave. After a century of contentious deliberation in the dusty archives of nations, we still can’t quite agree on the origins, causes, principles or consequences of World War I. We made up our minds long ago about what to believe about good and evil and right and wrong. But even while we’re believing what we believe, a thousand others are lining up to contradict us with their belligerent counterfeits. We know that an archduke was assassinated and a complex web of alliances obliged disparate nations to attack their cousins and defend their neighbours. But the recorded treaties of the temporal and political are but one dimension in a black and white history of hypothetical what ifs, how abouts and countless unknown unknowns. What we do know is that 888,246 British military lives were lost between 1914-1918. And in this centennial commemoration of the end of that scarlet tide, we long to know the technicolor facts. Every Briton who died in combat became a noble drop in this ocean of blood, and those who lost an arm or a leg became living heroes. Those whose eyes were melted and faces disfigured with fire; and those who shivered as they were shot at dawn – well, we don’t want to think too deeply, do we? War is an apocalypse of hell, and there’s a warm bed reserved somewhere in eternity for each and every one of its massed victims. Even after World War II and all the successive wars and rumours of wars, it is clear that we have failed to eliminate the ideological impulse to dominate and eradicate. The war to end all wars was nothing of the sort: aggressors still have black objectives and defenders have white motives. And in the irreconcilably divergent perspectives and mutual exclusions we see the multi-colour trauma, suffering and bloodshed that is pre-ordained. Whatever the losses or gains; however we reason the moral dichotomies or enforce political agreements, we must never take for granted the liberty and autonomy of national sovereignty. Some carp that World War I was a national tragedy – a whole generation of our brightest and best lie buried somewhere on the long, long trail of trenches from Ypres to the Somme. Lions led by donkeys, they say, left hanging on the old barbed wire for vacuous notions of nationalism and crass pseudo-patriotism. Don’t believe them. That is the black and white caricature of futility. Don’t dignify their monochrome cynicism or prettify their one-dimensional pessimism with a second thought. Just be silent and perfectly still. 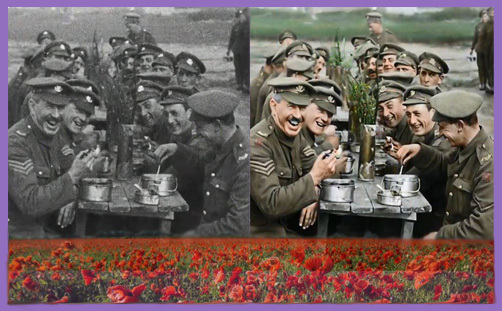 Take time to study a coloured image of their joyous witness, and give thanks that that each and every one of them gave all their yesterdays so that we might have today, and our children and grandchildren can revel in a thousand tomorrows. We live in colour because they died in black and white. And now that we can see them in hues of green and red, our judgment shows itself in a thousand greys of futility. Be not deceived: they did not die in vain; war is not futile. They are not here so that we might be; and in that being is their infinite and everlasting worth. We will remember them.